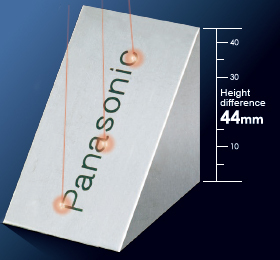 Panasonic Industrial Devices SUNX's top-level 40 W high output FAYb laser marker marks or processes deeper and faster on metallic workpieces. 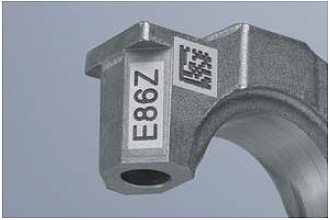 Handles an expanded range of laser marker marking / processing applications. Allows deeper and sharper marking and processing to handle demanding applications. No blade is used for high-quality, stable processing. The larger the energy amount sent to the workpiece, the faster and deeper the marking / processing. Takt time reduction greatly enhances productivity. 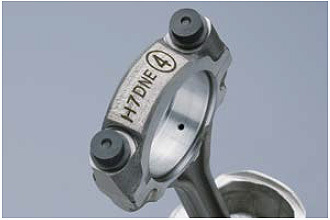 Significant improvements in radiation performance enabled a small and fanless head design which is capable of high output. Install with confidence, free from worry about fan clogs. Employs an inner and outer layer Double Protective Design for better airtightness inside the head. The complete air tight seal prevents dust and water entering from any direction for stable operation on the production floor. 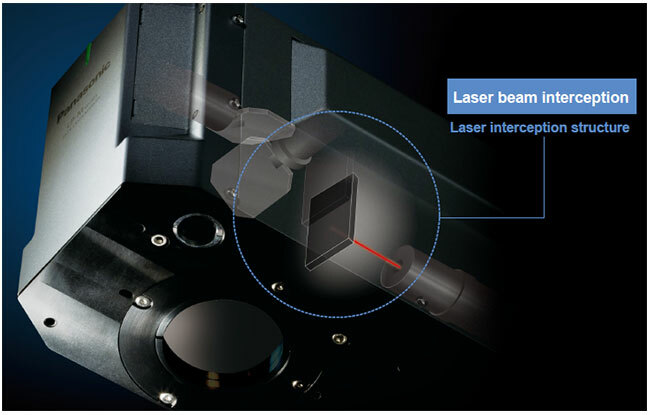 In a revolutionary method, the FAYb laser amplifies a weak laser beam from a master oscillator as it passes through a fiber treated with the element Ytterbium to emit a strong laser beam. Conversion loss is minimal as the FAYb laser amplifies laser beams in the fiber and achieves an excellent beam-to-beam conversion efficiency of approximately 50%. 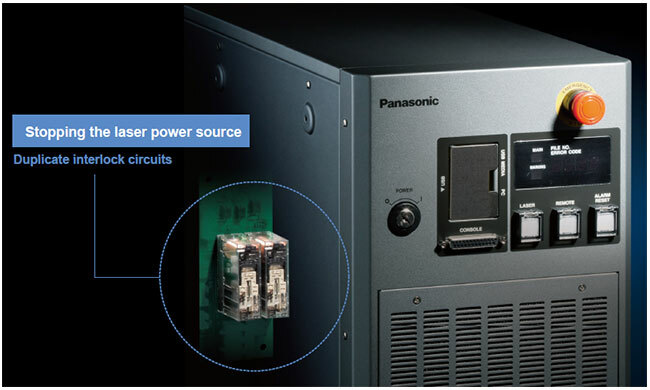 Power consumption is minimized despite high output and contributes to reduced carbon footprint. 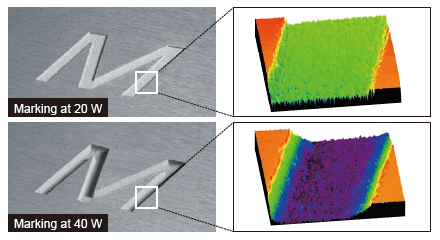 Weak pulse laser beams are amplified by absorbing low-output LD beams as they pass through the fiber. 3D Control capability allows marking on various types of products and complicated shapes to meet a large number of application needs. Enables the best marking on every product type. 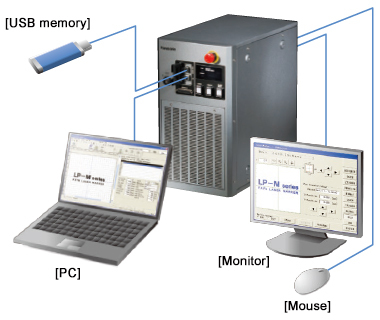 The LP-M series contributes to production efficiencies, equipment miniaturization and reduced costs. 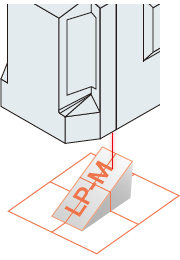 The Z-axis stroke mechanism controls the laser beam focal point in the Z-direction to enable marking on an item with height differences. Marks clearly with no distortion on slanted, curved and stepped surface shapes. 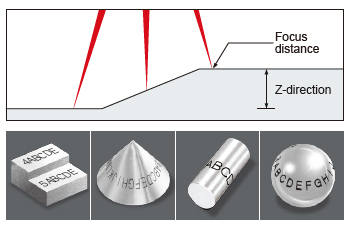 Spot average marking enables control of the laser beam spot diameter for uniform marking thickness and depth. 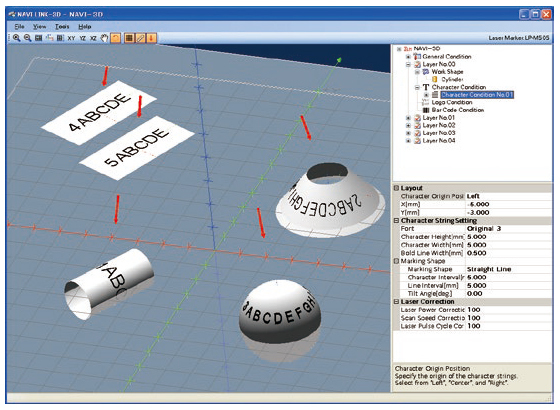 Easy-to-use software enables you to create marking data by simply overlapping a workpiece shape with the characters and shape data to mark. Check the workpiece from any angle on the image screen to make simple adjustments. For use in overseas factories, English is also available in addition to Japanese. Varying workpiece heights during production causes discrepancies in printing quality. 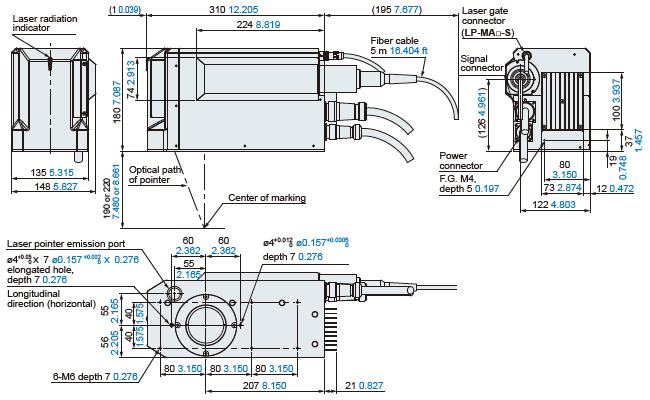 The LP-M series can measure workpiece height data directly with the displacement sensor. All workpiece heights can be checked before marking for stable production quality. Concern for machine safety has increased as globalization progresses. Two newly mounted safety mechanisms improve both Productivity and Safety. Durability has vastly improved since the first laser interceptor developed. Two outputs can be monitored to check laser interception. 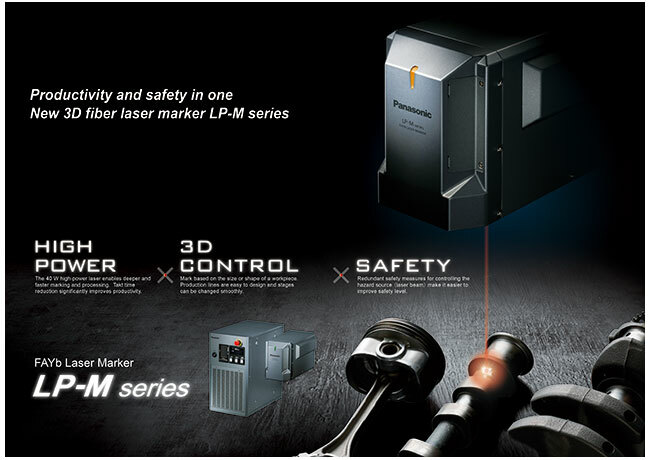 Safety is ensured even when the laser power source is on, preventing productivity losses. Mounted with 2 interlock circuits instead of one. 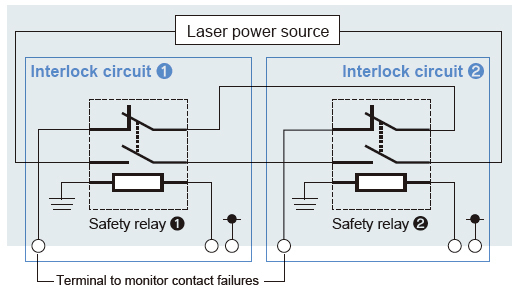 A safety relay is also deployed to ensure the laser power source is stopped. 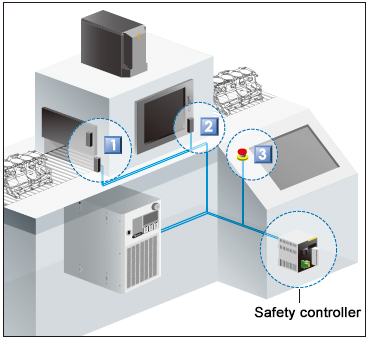 International standard ISO 13849-1 (JIS B 9705-1) regulates safety function of safety-related parts of control systems, and requires safeguards be taken for an entire system embedded with a laser marker. 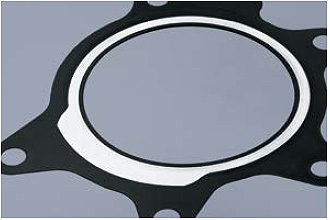 Each time a workpiece is loaded or unloaded, the shutter opens and closes. When the shutter is open, the laser intercept mechanism closes to ensure safety. 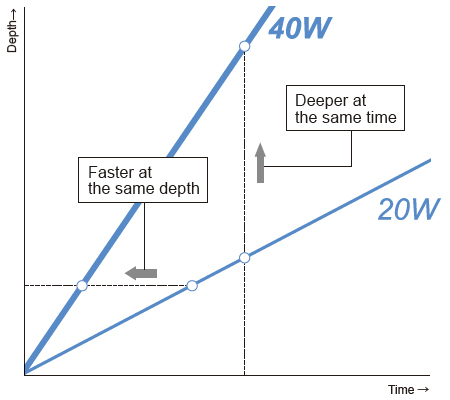 Impacts on production efficiency during mass production are avoided because the laser power source does not need to be stopped each time it opens or closes. ［Operation safety device］ Safety magnetic switch, etc. The shutter opens and closes during maintenance or fine tuning. When the shutter is open, the laser intercept mechanism closes to ensure safety. Work efficiency during mass production is not lost because the laser power source does not need to be stopped each time it opens or closes. ［Operation safety device］ Safety door switch, etc. In an emergency, forces the laser power source (hazard source) to stop. Measures the power when marking, when outside a set range, uses error output to notify. Stops laser immediately if a severed fiber line is detected. Stops laser immediately if unforeseen laser irradiation is detected. Also equipped to the laser marker controller. Can be stopped individually. 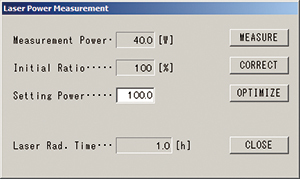 Measures the current laser output. Monitor laser output attenuation from the time of purchase. Calibrate with a commercially available power meter. Displays error time, date and details. Multiple functions added to the design make work on the factory floor easier. Simple connection to multiple laser markers and peripherals. Includes PC software for simple configuration of marking data. Data can even be created off-site (Multiple languages supported). Package includes software to create logos, software to create fonts, and Adobe® Illustrator® Plug-In. Create any kind of data. *Adobe® and Illustrator® are registered trademarks of Adobe Systems Incorporated. 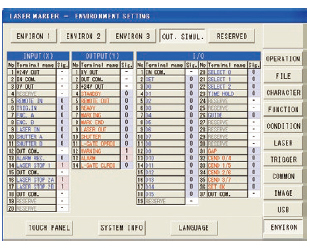 Connect a monitor and mouse to operate the unit using a large screen. Settings can be saved to a commercially available USB flash drive source to backup marking conditions, or copy data to multiple laser markers. *Requires an operation check in advance. Easily switch among Japanese, English, simplified Chinese, Korean and German. Connector I/O can be checked on a monitor. Signals can be quickly checked at equipment startup. The marking area or characters to be marked are traced with a red light. Time required for marking can be measured in advance, aiding pre-marking check tasks. 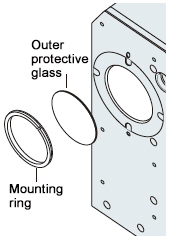 The laser beam port is constructed of double-layered protective glass. The outer layer of protective glass is removable, and cleaning is easy. If an extra protective glass* procured in advance and used, the production line does not have to be stopped even during cleaning. 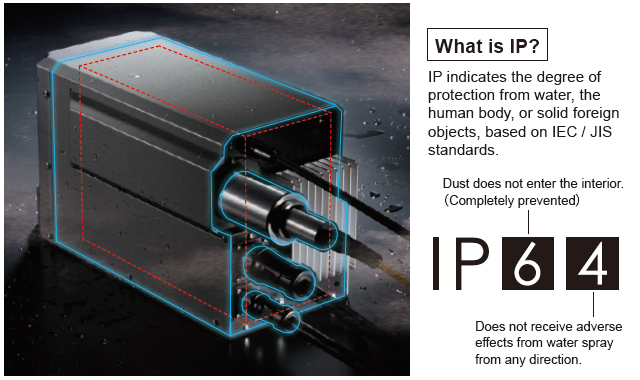 The laser beam port is protected from dust or damage, reducing maintenance costs. *Extra protective glass is optional. Maximum 12,000 mm/sec. 472.441 in/sec. RSS-14 (GS1 DataBar) CC-A, RSS (GS1 DataBar) Limited CC-A, RSS (GS1 DataBar) Expanded CC-A, UCC / EAN COMPOSITE, etc. Output at product processing edge (at configured power of 100, standard factory settings). File format (logo file) that can be used by the laser marker. Use a dry contact to connect the INTERLOCK 1 PIN-3 PIN. Deposition on the internal relay contact point can be monitored using INTERLOCK 1-2 PIN and INTERLOCK 2-2 PIN. When 1 PIN-3 PIN is closed, 2 PIN-2 PIN opens. 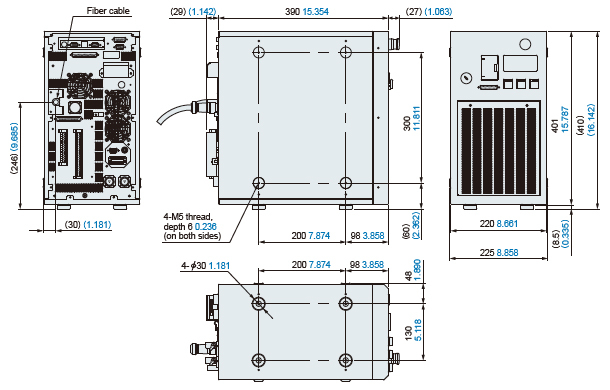 The head is IP64 only in regions where an electrical or optical part is deployed. To use Export Vec, Adobe® Illustrator® Japanese language Ver. 9/10/CS - CS6 (Japanese OS only), English language CS3 - CS6 (English OS only), or Simplified Chinese CS5 - CS6 (Simplified Chinese OS only) must be installed. Windows® 7 Professional, Vista Business, and XP Professional are trademarks or registered trademarks of Microsoft Corporation in the United State and other countries. ・China models are available,too. Please contact our sales office. This product is classified as a Class 4 Laser Product in IEC/JIS/FDA regulations 21 CFR 1040.10 and 1040.11. Never look at or touch the direct laser beam and its reflection. 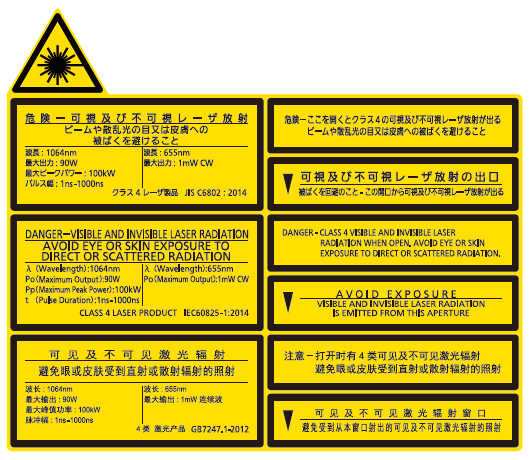 The following labels are attached to the LP-M500 series. Handle the product according to the instruction given on the warning labels. The laser used by this product generates infrared light that is invisible to the human eye. Use particular caution when the laser is operating. 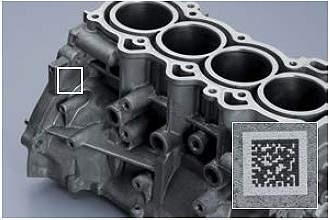 Regularly clean the air filter attached to the FAYb Laser Marker to maintain cooling effects. 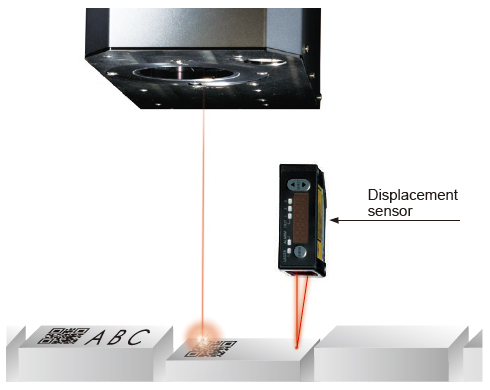 Dust or chips adhering to the laser pointer emission port may affect the printing quality or seriously damage the laser marker. Clean the laser pointer emission port regularly. Depending on the object being marked, harmful gasses or smoke that have a detrimental effect on the human body or the laser marker may be generating during marking. If your application falls under this description, use a dust collector. *For more information, contact your sales representative.